Yesterday Nick took Gregory to the park and I finished my last two blocks for my bee quilt (contributions came from the Boston Modern Quilt Guild and Hip to Bee Square flickr bee). I am waiting on one last block. Yesterday I finally decided to write a person in the bee who I had not received a block from- and it turns out that the package had been misplaced and she hadn't mailed it yet. Phew! I had seen her picture of what she made and I am so relieved it wasn't lost! I love the way this quilt is looking but I am surprised at how "small" the quilt looks after having accrued blocks from two bees and making several blocks myself. Hopefully I can show you the completed top soon. I finally spent most of my birthday money on some Joel Dewberry Heirloom. The blog world seems to really be falling hard for the Citrine pallette (orange, aqua, yellow) but I am very happy with my choice of Sapphire. If you have any suggestions for a good pattern that showcases large scale prints - let me know. A good friend of mine is having her second baby girl in December. I want to make her a quilt and invited myself to her house with a huge bag full of fabric choices. She has a background in interior design and before I knew it - she pulled apart some of my little "themed" packets/collections and made this: a red, pink, green pallette with a hint of orange. I love it! I told her I needed to add more, so these are the fabrics I put together on the bottom row: What do you think? I do think it needs some editing still. I am thinking about using this brand-new sheet as sashing for the quilt. Normally I am against using anything but normal Kona - but this sheet has a nice and soft texture and has a subtle chevron pattern in it. I know that using a cheap sheet is discouraged - but this sheet is 250 thread count, 100% cotton. Any thoughts? Hello to all of my new followers! Thanks for visiting! I'm absolutely in love with that mosaic quilt! I plan on making one soon. Heirloom (all of it) is awesome. That lilac quilt looks amaaaaazing. Go, Laurie!!! 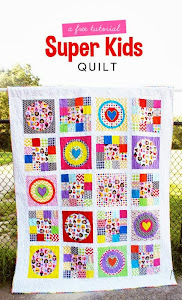 Hi Laurie just want you to know I am still stalking you and love everything you're doing - the bee quilt (hip to bee square) is AWESOME and seems to be coming together nicely. I love the red pink green orange pallette and have an opinion (Does that surprise you?) - I would drop the pink you show on top on the lower right of your pic - it just seems like a tad too much pink. Otherwise I LOVE the ones you chose! Keep up the good work you have inspired me more that you will ever know! Loving the mosaic quilt! The palette is so gorgeous! I agree with the previous poster re: the left most pink in you choices - it seems redundant and you could do without it. 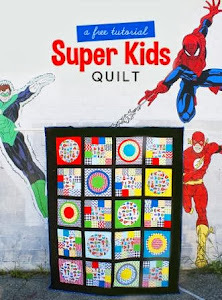 I have no idea about the sheets, but Crazy Mom Quilts swears by some she buys at Ikea, and I trust her recommendations!